Improved sound and plenty of connectivity options make the DacMagic a no-brainer for any modern audiophile. It was way back in the late 1980s that Arcam produced the first dedicated hi-fi digital to analogue converter with the appropriately named Black Box. This humble looking slab of hi-fi history had a swift knock-on effect as other manufacturers rushed their products to market. The reasoning was sound enough: separating the delicate digital and analogue sections of a CD player from noisy motors and power supplies would lead to a much lower noise floor, while the dedicated transport had particular attention paid to improved clocking of the digital stream, reducing digital ‘jitter’ and therefore improving sound quality even further. The meteoric rise of the DAC, however, was mirrored by its eventual decline as CD player manufacturers improved their game with better on-board DACs and superior isolation of the power supply and transport motor from the sensitive converter and analogue output. Now, because of the ascendance of the humble computer as a music source, the almost extinct external DAC has made quite a comeback of late. I have owned D/A converters from illustrious hi-fi companies such as Meridian, Esoteric and DPA, but the DacMagic One I bought in 1995 will be the one I remember most fondly. It was way easier on the pocket than either of the other D/A converters and yet offered a sound quality that belied the price tag. Just as impressive as the audio performance were the connectivity options: with three digital inputs I could connect my CD player, DAT tape deck and minidisc player at the same time. Oh, the good old days! So here we are 15 years later with the all-new Cambridge Audio DacMagic. 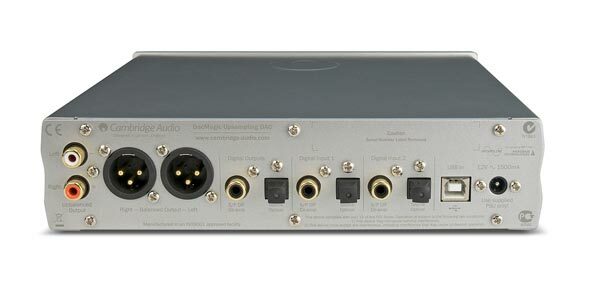 Unlike the earlier versions the latest DacMagic is quite a diminutive component, yet it has a considerable amount of technology on board and inputs/outputs galore – two sets of either Coaxial or Optical inputs, a USB input and the option of either conventional RCA or balanced outputs. And that’s not all: it also as an optical and coaxial digital output for digital recording or as a bitstream signal pass-through for home theatre systems – handy for those wishing to use their DVD player as a CD transport without losing its 5.1 channel ability. The DAC will up-sample 16/44.1 redbook CD to 24/192, and its sound is customisable with three DSP filter settings, allowing subtle changes to the analogue output. I experimented with all the filter settings, but found myself mainly employing either the Linear Phase or Minimum Phase setting. The majority of my listening was spent using Logitech’s fabulous Squeezebox Duet, and the DAC handled every file format I threw at it. FLAC, MP3, AAC and Apple Lossless were all enhanced by the DacMagic, improving both detail retrieval and heightening the soundstage of recordings such as Andrea Bocelli’s Incanto. Heavier music didn’t faze the DacMagic either as it helped to produce a rousing performance of Tool’s ‘Lateralus’, one of my favourite albums from the prog metal masters. I was also delighted with the sound of the DacMagic connected via USB to my MacMini; it made a fairly okay-sounding rig (Kingrex T-Amp + Klipsch Synergy B2’s) really come alive.